Anyone who has spent serious time outdoors knows that in survival situations, wild plants are often the only sustenance available. The proper identification of these plants can mean the difference between survival and death. 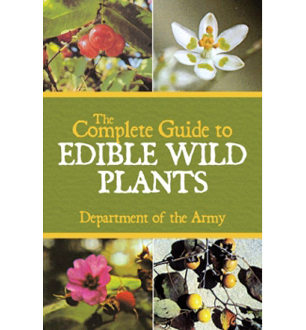 This book describes habitat and distribution, physical characteristics, and edible parts of wild plants-the key elements of identification. Hugely important to the book are its color photos. There are over one hundred of them, further simplifying the identification of poisonous and edible plants. No serious outdoors person should ever hit the trail without this book and the knowledge contained within it. The Department of the Army is headquartered at the Pentagon in Arlington, Virginia, and also authors other texts about survival, fighting and other bad stuff. Do not mess with them or they will bust you up.